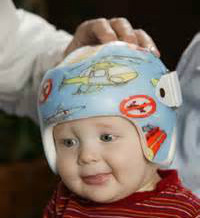 Cranial Remolding helmets are used to treat positional Plagiocephaly, Brachycephaly, Scaphocephaly and other head shape deformities in children ages 3-18 months. We maintain a high level of care by solely providing FDA approved helmets as fabricated by OrthoAmerica. Please find additional information by clicking on the resources below. Your first visit will include an evaluation, measurements and 3-D scanning. The scan is then sent for fabrication to Orthomerica who maintains FDA clearance for fabrication of the helmets.